Another H&M collaboration, the Maison Martin Margiela collection for H&M is definitely one of the most interesting ones to date - and I'm not only talking from a design point of view. I'm talking in terms of past collaborations. Let's have a look at the pieces; a cool colour palette has been used, the designs are quite neutral, textured jackets and random bolts of solid colour - the collection is definitely signature Margiela; which equals a very contemporary and experimental style. Each tag will have a unique label showcasing what previous Margiela collection has inspired that particular piece. Now, what I will be curious to observe is the fact that this collection has a higher price range in comparison to prior collections, also this collection is not 'mainstream' (for lack of a better word) as the H&M designer collaborations have been in the past. Some of these Margiela pieces really are an acquired taste and not something everyone would be able to pull off. Past collections such as Lanvin x H&M, Anna Dello Russo x H&M, Versace x H&M (and so on) were phenomenal in terms of sales and resulted in each and every piece getting sold out within no time. 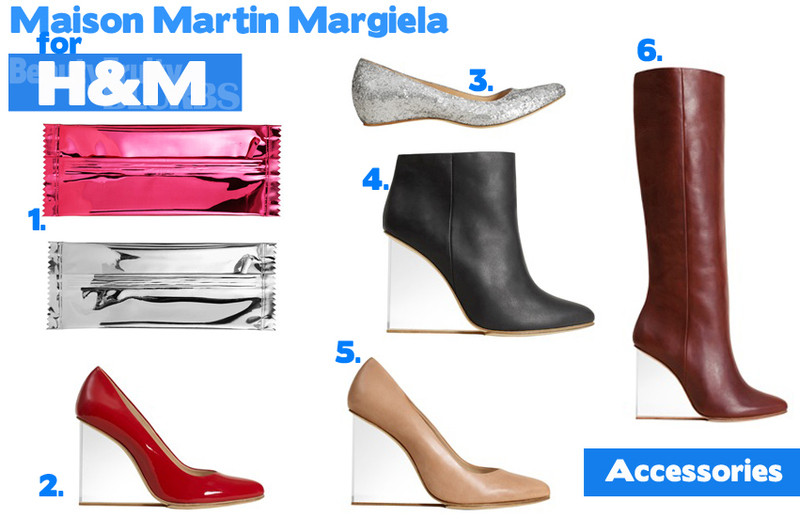 How will Maison Martin Margiela for H&M fare in comparison? We shall find out tomorrow, on the 15th of November 2012, as this collection launches worldwide. Below are some designs that stood out the most for me from the look book of over 120 different pieces. I personally do like the collection, it is different, bold and daring. It's great that this collection has catered to both men and women alike.The jackets and coats are beautifully crafted and the candy wrapper clutch (as seen on Louise Roe here) is my personal favourite and a must-have from this collection, especially in the metallic pink colour. Will you be heading down to H&M tomorrow?